The trees are dark against a gray sky this morning. As the hours pass it is getting lighter. Maybe we’ll have sun later on. As I stood on the patio with Charlie this morning, I heard a commotion of birds in a distant tree. Various types of birds because they made different noises. But I never could locate them. Then I saw the hummingbird dive into the branches of the big tree in the corner. I’ve about given up hope that I’ll ever get a photo because it never seems to land. 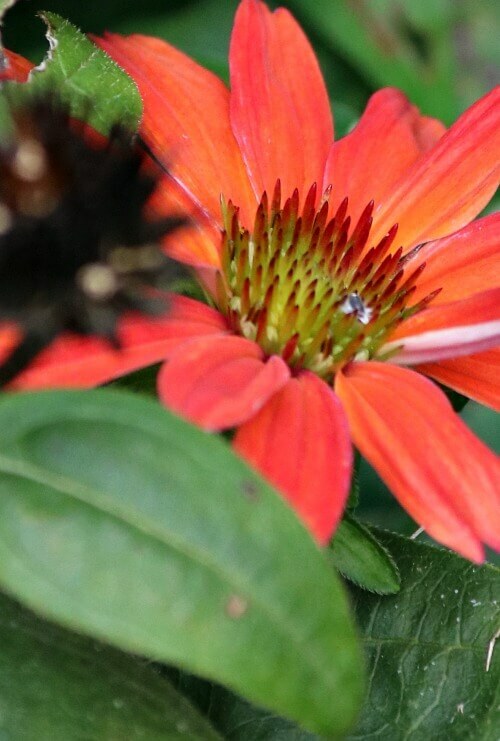 The cone flowers had turned brown a month ago. But now in the cooler weather one has bloomed again. There must be a creature out on the patio that Charlie has the scent of. He frets and begs to go out. Last night and this morning he seems disturbed. He just will not settle down. Last night I took photos of him searching for it and put it into a collage. It was comical to watch him. I told him he was going to go into that jungle and get stuck. But he managed to weave his way in and out. I’m just glad that so far there has been no bloody urine since he ended his antibiotic last Wednesday. So far, so good. However, I have not left him once. I don’t know if that had anything to do with it; it would seem doubtful. But still I have been here to see if it makes any difference. And I am watching him closely. We’ve now had two evenings when it’s been a bit nippy. Funny how you forget from one year to the next how that feels. I guess it’s kind of like childbirth. The heat is hot and worrisome, and suddenly the weather changes. It’s like there is a sigh from Mother Nature. She has grown weary of the humid heat herself. And this sigh blows cooler weather toward us. It is much appreciated, this change in the air. Just like in the winter when the first breaths of springtime put a bounce in our step. There is the expectation of warmth and spring flowers emerging from the bare earth. 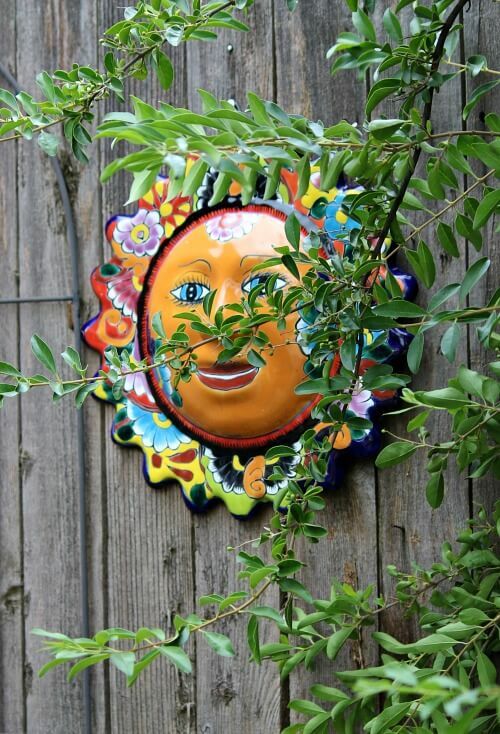 Each year my suns on the wooden fence look a little more tired. However I love the patina as they age. The big one hanging on the fence just outside the patio door has been with me for at least 10 years. Then there is the colorful sun hanging on the fence that divides me from the neighbor next door. The apartment is still empty, but she will be moving in in October, I hear. I finished reading “The Twelve Mile Straight” last night and began reading “Three Things About Elsie.” I really like “The Twelve Mile Straight.” It had more than 500 pages and I loved every one of them. 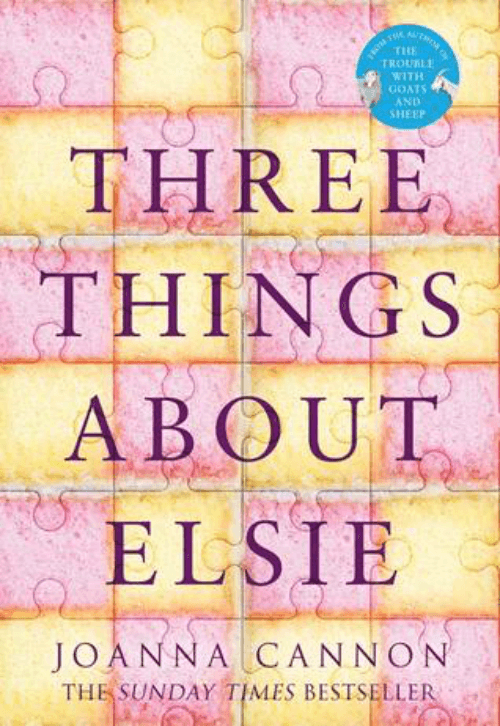 With “Three Things About Elsie,” the book begins with 84 year old Florence having fallen in her flat at Cherry Tree Home For The Elderly. As she waits to be rescued, many things come to her as she thinks about her life. The explaining seems to revolve around a terrible secret from their past that may be about to come to light. There is a new male resident who looks very much like a man they knew 60 years ago but who has a different name. They wonder if he is who he claims to be, though they are certain that he died a long time ago. charge since it’s their equipment failure!!! I pay an amount, think it’s around $6 per month so when they come out I’m not charged. I would certainly love some cooler weather around here. It is still quite warm here. I look forward to fall. Priss and I would love to sit out on the patio without mosquitoes everywhere! I’m still seeing hummingbirds flying around the yard! I can’t believe we’re already having cooler weather. Hasn’t happened this time of year in a long while. The collage of Charlie pictures is sweet! I can just visualize him running about. Cooler air is indeed a relief. The heat and humidity wore me out! Fall always puts me in the mood to begin settling down and “nesting” for the winter after fall yard cleanup…which has yet to begin. Brenda your patio still looks lush and lovely! I’m just not in the mood to cut back plants and do fall clean up. Working with the plants irritates my eyes. I agree, your patio is beautiful and such a luxury, I would be happy to have one like that, but I do realize that there was a big expense to you developing it, with all the plants and pots, not to mention the soil, amendments, etc. But such a pleasure. If I had an outside faucet I would be very tempted to make one of my own, but the thought of carrying water clear from the kitchen all through the living room to water them is daunting. And I get so much scorching sun, with no overhang for shade at all during the day, I would be watering several tines a day. So maybe one of these days I will attempt one. Charlie is a hoot, I wonder what he smells out side. The mice will be trying to get inside soon since the cooler weather is coming on. Here, it is cool in the late evenings and early hours of the morning. We are expecting much cooler weather starting this week. I am partly sad to see the summer over, and partly happy that cooler weather is coming soon. I hate mice. I will have to put fresh cotton puffs soaked in peppermint essential oil out under sink, etc. It is still so hot and dry here. We could use a good soaking — no matter how much I water, it is just not the same as the rain Mother Nature provides. And I am looking forward to cooler weather. Right now it is in the high 80’s during the day and high 70’s at night. 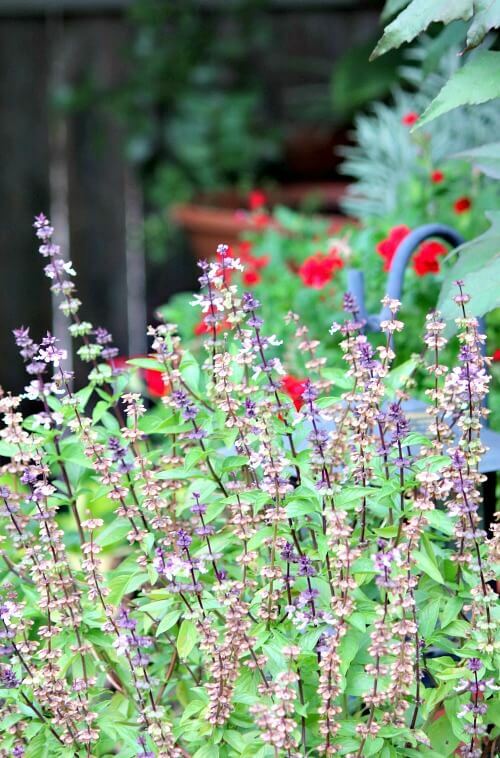 Your garden looks so lovely — even without a lot of flowers, you still have so much variation in the greenery, the height, the pots, and the decor. 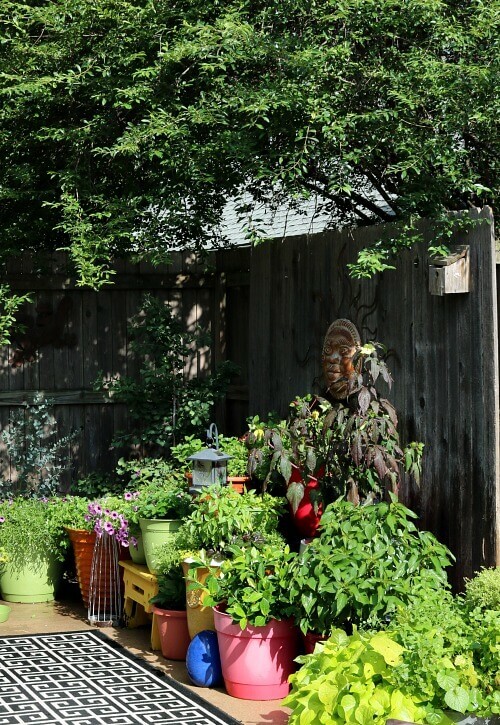 Love the garden wall decor — I have been browsing Joss & Main, etc. 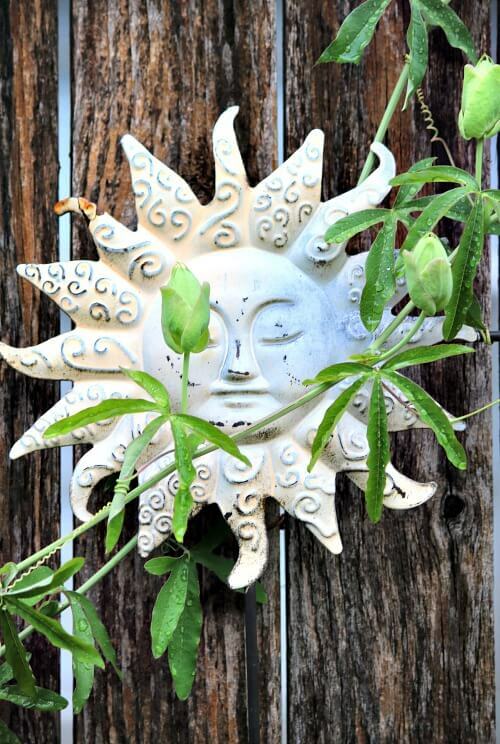 for some pretty sun/moon outdoor wall decor. Abi never really cared about critters. Except for the time we had the tortoise in the yard at the little blue house, or the possum here. But Charlie is always on the hunt. Glad to hear that Charlie is okay. Six o;clock this morning it was quite cool here in Southern Ontario but it tuned out to be a beautiful warm day so we sat in the garden for a couple of hours with Dexter. He tends to follow us everywhere and comes inside when we do but today he has stopped out side in the sun, maybe he knows what will be coming soon! He is sooo spoiled but we wouldn’t have it any other way. 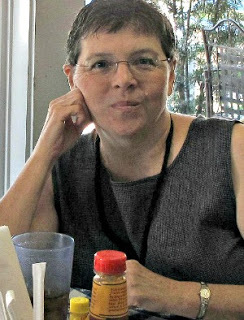 I read your blog yesterday on slow living and loved it. I do think that is what I do now, I enjoy my garden so much, I think this is the place where I am most at peace. Being outside in nature soothes my soul and lifts my spirit. Would love to live in the country in a modest cottage surrounded by trees but unfortunately as we get older we need to be near a hospital as Simon (hubby) goes several times a year for checkups. Love the pictures of Charlie searching for something! I’ve learned that we can enjoy “slow living” no matter where we happen to live. I am peaceful right here in the middle of the city. Love your patio, it is so cozy looking. Love the sun faces. The pictures of Charlie are so cute. Hope he found what he was looking for. Cool and windy here today, but suppose to be hot this coming week. No, he hasn’t found it yet. But he got a bath yesterday evening because he has allergies and coughs so. So when he starts going into “the jungle” of the patio plants I say “bath.” He hates that word! My lil Mallory is similar to Charlie she is a terrier ,she is constantly looking for frogs and squirrels .Charlie reminds me of her . We will be taking her for surgery next month she has a tumour on her back vet has been watching it but has gotten larger last few weeks gotta get it out fingers crossed .Hope this will not be another loss for us .She is our precious baby .Enjoy your Sunday ! Love your garden it is very beautiful ! Charlie, the Dogie Detective – always “snooping” around!! Such CUTE pics of Charlie. Charlie is so cute…and I know he is so much comfort to you. That sounds like a really wonderful book so I added to my ever expanding list. Those pictures of Charlie are just hysterical. He is hot on the trail of ‘something’. I love that colorful sun, too! And all the wonderful plants you grow, Brenda. What a cute little collage of Charlie. He’s so intent on catching whatever he thinks he’s chasing. I’m so glad to hear that he’s doing so well, so far. Perhaps the medicine took care of whatever it was on the second round. Sure hope so. I like the suggestion above about writing a children’s book about Charlie and Abi. You could try it out on Andrew. We’re enjoying cooler weather here, too. In fact I was kind of cold last night as I went to bed. My bedroom is on the northeast corner of my house and has two good-sized windows so it is always the coldest in the house in winter. In fact, I have a little heater in that room that I warm things up with before I go to bed. I almost felt like I wanted to turn it on last night! I feel like we might have to turn the furnace on soon. Guess I better go to bed. I stay up too late! Pats and hugs.